The New American Commentary series is an exceptionally acclaimed resource for ministers and Bible students who want to understand and expound the Scriptures. This highly readable exposition includes the NIV text printed in the body of the commentary. 554 pages, from Broadman & Holman. About "Exodus (#02 in New American Commentary Series)"
Resource for ministers and Bible students who want to understand and expound upon the book of Exodus. 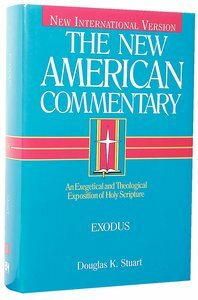 THE NEW AMERICAN COMMENTARY is for the minister or Bible student who wants to understand and expound the Scriptures. Notable features include: * commentary based on THE NEW INTERNATIONAL VERSION;* the NIV text printed in the body of the commentary; * sound scholarly methodology that reflects capable research in the original languages; * interpretation that emphasizes the theological unity of each book and of Scripture as a whole; * readable and applicable exposition. Douglas K. Stuart (Ph.D. Harvard University) is professor of Old Testament at Gordon-Conwell Theological Seminary in South Hamilton, Massachusetts. He is the author of articles in major journals and magazines, including the Journal of Biblical Literature, the Bulletin of the Schools of Oriental Research, Christianity Today, Decision magazine, etc. He has written eleven books including the bestseller How To Read the Bible for all its Worth (with G.D. Fee, Zondervan), also How to Read the Bible Book by Book: A Guided Tour (Zondervan), Hosea,Jonah (Word Biblical Commentary), Ezekiel (Communicator's Commentary) and Exodus (New American Commentary).